Thank you to the Spartanburg Convention & Visitiors Bureau for helping us share some highlights of what to do while in Spartanburg for The Assaults! You are likely reading this blog because you are taking part in the Assault on Mt. Mitchell or the Assault on Marion and want to know more about the routes. But you should also want to know what you can do in Spartanburg before and after the ride. 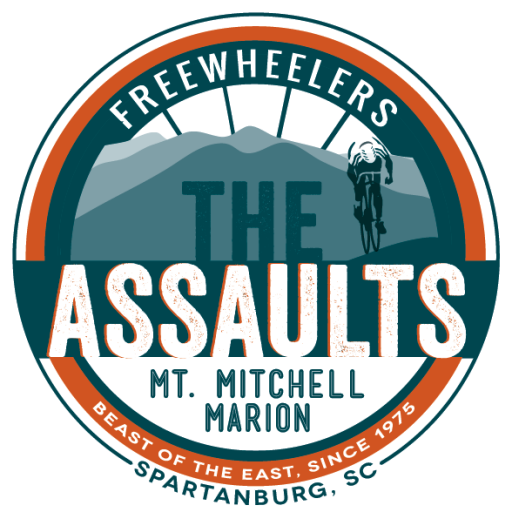 Spartanburg is a very cycling-friendly community, where you can find group rides every day of the week (check The Assaults Facebook page), and you are going to have a lot of fun here. The rides begin near downtown, and travel through much of Spartanburg County before heading over the state line to North Carolina. So, let’s start with the basics for what you will want when getting ready for and after a challenging ride like The Assaults. First: Craft Beer. Spartanburg has more than 40 restaurants and bars in a two-mile radius around The Assaults starting location. But if you want to try something local, check out RJ Rockers and Hub City Tap House, which are both located downtown. Both brew their own beer on site, and in the case of the Tap House, cider as well. Both offer plenty of choices of craft beer in a laid back atmosphere. And The Growler Haus is at the top of Morgan Square, and has 24 craft beers on tap, along with several more in bottles and cans. Second: Food. Spartanburg also is a rising culinary destination. William Cribb, of Cribb’s Kitchen and Willy Taco, was just named a South Carolina Chef Ambassador by Gov. Nikki Haley. Our downtown food selections run the gamut of Thai, Italian, Southern, Farm-to-Table, well, you name we got it. And many have heard of the famous Beacon Drive-In, where you “call it” to get your food order placed. But wait until after the ride for that. Many may want to make a healthy meal or snack, so head to the Hub City Co-Op, which is South Carolina’s only member-owned, community grocery store that features local, organic and natural products. If you are coming to The Assaults, you obviously like going fast. Check out the BMW Zentrum to learn the history of the German automaker, right next to the manufacturing plant where four sport activity models are made and shipped around the world: X3, X4, X5, X6. While you are at, take some hot laps at the BMW Performance Center. It is guaranteed to be easier on your legs than The Assaults. Spartanburg also is a community sated with history, music and culture. You can spend hours exploring the Chapman Cultural Center to learn more about Spartanburg’s unique past, present and future. Do you know Spartanburg’s connection to the legendary rock band Pink Floyd? You will learn it and more after following the Spartanburg Music Trail. And this is just the tip of the mountain (pardon the pun) when it comes to Spartanburg. Get some more fun ideas at www.visitspartanburg.com.